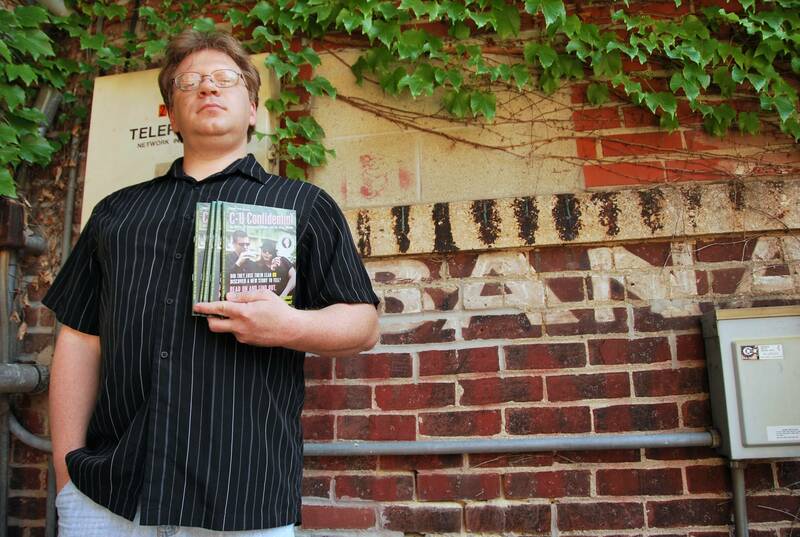 Jason Pankoke may not be the all-knowing super-human some suspect he is, but there is no denying that he is instrumental in the Champaign-Urbana film community. He helped organize the outstanding New Art Film Festival earlier this year, which I chose as the Best Film Festival (other than Ebertfest), and is celebrating the recent release of the sixth edition of C-U Confidential — a zine he has sustained over the past five years. Pankoke continues C-U Blogfidential and now also works on Bachelor Pad Magazine and Time Traveling Cinema with Psychic Joker. If you're not too exhausted thinking about all of that, read below to see what else he is getting himself into and where he stands on 40 North 88 West and the local arts scene in C-U. Smile Politely: You give away your zine for free … what allows you to do this? 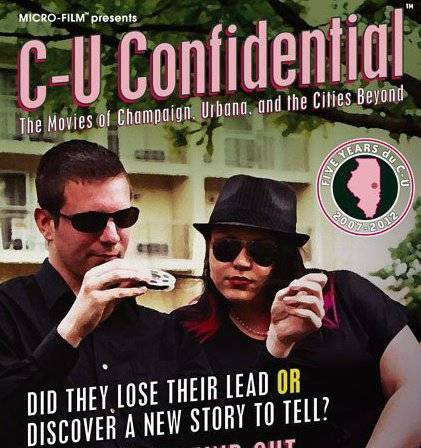 Jason Pankoke: I launched C-U Confidential in 2007 with the philosophy that the best way to get “all the local movie news fit to print” in the hands of my friends, neighbors, and fellow Ebertfest attendees was to remove the price barrier, if at all possible. The cost is covered mostly by advertising revenue with the difference made up by yours truly, which lately has been difficult due to cost overruns on the most recent two issues and the fact I was unemployed most of 2011. It’s the joy and pain of doing it yourself, even after all these years. The cover price is mainly to establish a monetary worth for those all-too-rare back issue sales. I obviously need to step that up somewhat. SP: What keeps you motivated to put so much work into something without filling your pocket? Pankoke: I believe the primary difference between publishing MICRO-FILM, the forerunner to C-U Confidential, and CUZine itself is there’s a much greater need for the latter than the former, both from a community and personal standpoint. For seven years, I covered eclectic movies and their makers through MICRO-FILM (MF) that could hardly be labeled “mainstream,” yet enough similar press outlets like Film Threat, Cashiers du Cinemart, Psychotronic Cinema, and indieWIRE handled the same milieu with greater reach that MF arguably became redundant. I burnt out on the whole effort and MF went into a deep sleep. After licking my wounds, though, I still felt the itch to publish and turned MICRO-FILM’s local section into its own “local-zine” because I found refreshing inspiration in my own backyard. In the long run, I believe I want to understand “what it all means” to be a successful and creative individual living in places like Champaign-Urbana, Illinois, and the nearby “cities beyond.” I share my observations through CUZine and its on-line companion, C-U Blogfidential, as I chronicle the stories of area movie artists, both in front of and behind the camera. At the same time, I guess I don’t know when to quit. CUZine is my own objet d’art, which happens to look like a digest, mini-magazine, ‘zine, faux pulp novel, or whatever else you want to call it. I’m lucky to be acquainted with a core group of local filmmakers, media producers, theater owners, cinema connoisseurs, proponents of C-U culture, and area alumni working in the entertainment business who not only provide me a steady flow of interesting activity to write about, but put their trust in me to translate said activity qualitatively into C-U Confidential. SP: How has C-U Confidential changed since it first appeared 5 years ago? Pankoke: C-U Confidential has not changed drastically since it first launched but, if you palm all six issues and flip through them in a sitting, you’ll find distinct shifts between the first and the most recent. I conceived CUZine as a sort of yearbook for C-U Blogfidential — nearly all the copy appearing in the early issues first ran on the Web — but recently I have solicited original material from gracious contributors to help shape its identity. Examples include the new issue’s make-up effects article by Samantha Daley of The ImageWorks FX in Chicago and a piece by local writer/producer Bill Kephart (The Haunted House, Revolting) about actors’ expectations on the set of a low-budget movie, as well as last issue’s stop-motion animation spread by Thomas Nicol, the organizer of Champaign Movie Makers. As for the visual design, I began to include larger images where I can fit them; the mag is about the cinematic art form, after all! In that respect, it feels a bit more like MICRO-FILM with each successive issue than the mannered “paperback novel” design I started with. Also, the new CUZine #6 features 12 interior color pages versus none in CUZine #1. This has given me the gumption to sneak in bonuses that readers might appreciate, such as the extra “mini-zine” in last year’s issue and the pull-out poster inside the new one. I’m trying to increase the sense of fun with CUZine’s presentation. I can’t see future C-U Confidential numbers looking much different physically, unless a larger advertising pool allows me to add more pages and additional color at some point. The words “biannual” and “special issue” also have a nice ring to them, do they not? SP: They sound good to me. What brought you to film initially? JP: I’ve always loved watching movies, dug learning the history beyond my favorite films, and marveled at the extensive and specialized talents required to put a single work together. (I’ve never been one to fawn over favorite movie stars or directors ad nauseum, however.) I grew up collecting movies on videos – remember VHS and Beta? – as well as reading the monster magazines of the day like Starlog and the original Famous Monsters of Filmland. I’ve never had formal instruction in film appreciation or filmmaking but thoughts of branching out into either have always been present and accounted for. I blame it on FM’s occasional make-up tutorials – an inspiration for our C-U Confidential make-up piece – and Starlog’s sister magazine Cinemagic – based on the classic pro-zine published by the late Don Dohler (The Alien Factor) and instructing amateur filmmakers on all aspects of the process – for picturing the art of filmmaking as, well, attainable. I remember trying out photographic tricks with Super 8 and 8mm video while in high school and college just to see if I could make them work. I’m sure many people presume I spend all my so-called free time sitting before glowing screens, watching and/or writing about the movies, while carting around a heavy load of encyclopedic cinema knowledge in my head and dumping it into conversations and on-line forums any chance that I get. I am guilty only because I satisfy none of the above assumptions. I don’t live for the movies; I try to live the best life that I can and if the study and act of artistic creation can complement that life, particularly when it involves the cinema, then I am a satisfied man. A driving force in what transpired once I moved to Champaign – writing liner notes for The Octopus’ genre film festivals at the Thunderbird Theater in Urbana pre-Canopy Club, contributing articles to FM antecedents Scary Monsters and Fangoria, volunteering for the local Freaky Film Festival which directly influenced my current local film activity, attending the earliest Ebertfests – is openly rooting for the underdog if I can’t actively help the underdog, particularly since I always have been one myself. All that said, I have never completed a film, even in the experimental/underground auteur sense. This is something I hope to rectify someday soon, multiple times over. SP: And how did you narrow your focus on local filmmaking in C-U? JP: I’m not blind. Champaign-Urbana film culture is covered in the local media but not extensively or consistently unless it involves such perennials as Ebertfest, the Art Theater, That’s Rentertainment, the Harvest Moon Twin Drive-In, the Virginia Theatre, and, um, Roger Ebert. It certainly has to do with space and personnel constraints but also the editorial need to profile people, places, and things which are timely and draw the eyes of readers who might also acknowledge the advertising directly adjacent to said editorial, thereby satisfying a financial need for those media outlets as well. Random and too-esoteric-for-its-own-good material will potentially turn away readers, tick off advertisers, and alienate those outlets. C-U Confidential proves there is much more to our scruffy little subculture than the commercial media lets on. Thankfully, the presence of operating dollars (however meager in sum) from advertisers already hip to the cause allows me to run with the local film baton relatively unfettered. I’ve attempted to attach an air of mystery and exclusivity to CUZine since most C-U filmmaking seems to transpire in a secret world just underneath our noses, yet carried out by creative and dedicated individuals you may very well know by name or face. For me, weaving that tapestry is the creative quotient that keeps me entertained and involved in the publishing process. I’m not certain how much CUZine itself has helped the local film culture, but at least it provides a starting point for the uninitiated and validates the efforts of the faithful. And, as my mother might say, it keeps me out of trouble. SP: What progress have you made in establishing a mini-Wiki filmography? JP: Honestly, I haven’t started building it yet. The filmography is going to be a completely separate project outside daily C-U Confidential needs, yet I’m not particularly sure I want to set it up as a wiki. I’m certainly open to guest contributors as well as readers offering anecdotes and ephemera I can work into the manuscript as a whole, but I’d rather go a more traditional route in shaping it. I’ll be the first to tell you that I don’t know everything there is to know about the movies of Champaign, Urbana, and the cities beyond – another film geek myth blown out of the water, only right here on Smile Politely – but I’m not afraid to spend time locating sources and corroborating the facts as best as possible. SP: Okay, what is it with Abraham Lincoln and vampires? There’s The Transient, about a vampire Abraham Lincoln killing virgins, and now this new film, Abraham Lincoln: Vampire Hunter, released just last week. JP: You forgot the omnipresent zombies! Yes indeed, rip-off specialists The Asylum unleashed something called Abraham Lincoln vs. Zombies a month ago and I’m sure we’ll be all the more schooled for it. Especially if one watches it in Blu-ray, which is available. I checked. Kill Vampire Lincoln Productions of Champaign produced the film short The Transient right before this pop culture trend of inserting famous historical figures into horror genre tropes came about. The director, Chris Lukeman, talks a bit in the new C-U Confidential about having to spend time explaining the difference between The Transient and Abraham Lincoln: Vampire Hunter, let alone justifying their efforts as an honest exercise in weirdo pop-horror comedy instead of a deliberate attempt to ride the coattails of the Hollywood movie or the Seth Grahame-Smith novel. Charmingly, their histories are intertwined by sheer coincidence because the vampire Lincoln actor in The Transient, Michael Krebs, later played the vampire-hunting Lincoln in an on-line promotional “trailer” for Smith’s novel. At least, I think it’s a coincidence. So, this begs the question … can Champaign-Urbana film influence the industry at large? Even beyond vampires and Roger Ebert? I, for one, would be curious to find out. SP: Yeah, that is pretty cool. I feel slighted somehow and I wasn't even involved. You’ve talked about the well-covered local music scene and how other artistic areas that haven’t been “given their due.” Why do you think the gap is larger between national and local filmmaking versus that of the national and local music? JP: Is there a disparity between local filmmaking and local music in terms of achieving commercial success, critical acclaim, coast-to-coast notoriety, and/or total hard drive space taken up on the portable media devices and laptops of consumers? I never would have thought to compare the two, honestly, but I’d have to agree the Champaign-Urbana cinema is still in its early stages of development and arguably a ways from shaking the pillars of Heaven as a culture or body of work. This is if you don’t expand “Champaign-Urbana cinema” to include former Champaign-Urbana residents who went on to create formidable film, video, and new media work elsewhere. It hardly means the usual suspects and guiding lights are failing to make strides. For instance, did you realize that 2011 was a banner year for the North American release of movies created in part or whole in central Illinois? Five feature-length titles landed national distribution last year: Sheeba in January, Disconnect in February, Leading Ladies in September, Farm in October, and Act Your Age in December. A sixth, the Eighties Hollywood pop musical Grandview U.S.A., which was shot on location in Pontiac, hit DVD in October. A seventh, Press Start 2 Continue, was made available as a self-released MOD (manufacture on demand) disc in March. And an eighth project, the Jay Rosenstein documentary The Lord is Not on Trial Here Today, received its first wave of PBS play between March and May. All but Grandview and Farm, produced in southern Illinois but completed locally, were C-U productions. I think this qualifies as some sort of progress for our fledgling scene. My comments in our first Smile Politely interview three years ago referred to what I perceived as the Champaign-Urbana film scene’s lack of presence in the media and, by proxy, the community consciousness. It seems like local films usually aren’t talked about unless they’re in production – the Leading Ladies team did a very good job keeping the C-U up to speed on their adventures – or premiering to a public audience – such as the no-budget Mahomet/C-U student-made mystery The Mahomet Journal, which just played Tuesday at the Art Theater and, therefore, earned a preview in Sunday’s News-Gazette – or making its DVD/mobile/streaming debut – Champaign’s Dark Maze Studios of Press Start fame is tops with the timely press release – or playing a larger event like a film festival. I realized a long time ago this spottiness is inevitable because narrative, documentary, and experimental filmmaking is simply not a common occurrence in the C-U. Of course, one of the main purposes of C-U Confidential is to pick up this slack in awareness. SP: I didn't know all of that and I'm pretty amazed. I bet folks in town would be even more amazed to hear of the local successes. You offered up a challenge to C-U's artisans and the community as a whole back in your 2009 SP interview. You said, "This is a town that has a crapload of untapped resources. Creating art is one thing, supporting art is another, yet the act of sustaining this creation and support across the board is where I feel Champaign-Urbana sometimes falls into a trap. It's a trick to keep such things going, but we all have to make the effort to breathe life into our arts every single day, cinematic or otherwise." How has the community fared since that time? 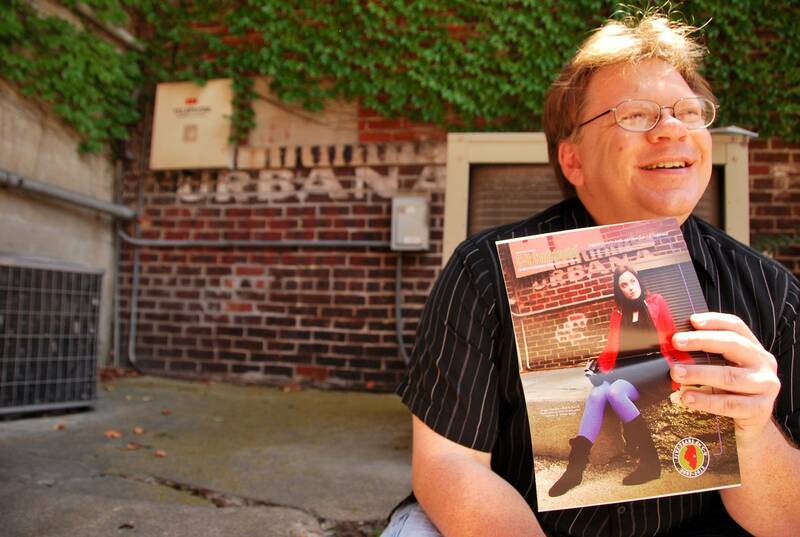 JP: I’m not sure I can speak for the Champaign-Urbana arts community at large. Most fruits of our collective labor I don’t get to enjoy since I’m my own main man at the Secret MICRO-FILM Headquarters. Unless a plethora of interns, secretaries, and/or consistent contributors decide to show up on my doorstep one fine day to help divide and conquer C-U Confidential duties, I’m stuck with the responsibility and it reduces my free time greatly. I do check out fine art exhibits when I can and have slowly taken in more Station Theatre performances during the past couple of years, but I don’t go out to hear live music nearly as often as I used to. (Yes, I know, boo to that.) The arts fabric seems to be holding relatively well from where I sit, especially with the strength in numbers of long-standing C-U events highlighting all my gifted friends and neighbors. SP: You’ve told me about an ongoing process of collaboration between local musicians and filmmakers (something I hope to cover more in-depth soon). How are things progressing on that front? JP: The campaign to recruit music and musicians for the soundtracks of local movies is fairly new. I happened to speak up about reaching out during a recent Champaign Movie Makers (CMM) meeting and the dynamic duo of Bill Kephart and Thomas Nicol – himself a hobbyist filmmaker responsible for the creepy and weird shorts Bedtime for Timmy, The Window Into Time, and Upgrade – ran with it. They introduced a half-dozen musicians during the May CMM at SoDo Theatre in downtown Champaign and played several interesting compositions which ran the gamut from bluesy and classical to prog-rock and electronic. I do not know if any collaboration has come out of it so far, but we’ll cross our fingers. If [any of] you would like to be added to the potential talent pool, be sure to contact Bill through CMM or the Champaign-Urbana Film Society! Not unlike live theatre, filmmaking encompasses so many different artistic and technical talents. Independent directors and movie producers have to be resourceful in landing the best possible combination of passionate, creative human beings to work with. As well, they must be ready and willing to shape their projects over a sustained period of time – which most people outside of film and television are simply not used to – because the act of movie-making is simply that encompassing. I’ve learned from recent conversations I’ve had with key individuals in our little film scene that an openness to collaborate on films is slowly but surely increasing, particularly when it comes to artists whose primary experience has involved, for instance, the stage and the recording studio. We’re all grateful for this development, I’m sure, and hope that it progresses to a point of cinema-making euphoria here in the C-U. SP: What is your take on 40 North and the changes going on there since our BEST Arts list ran last month? JP: I don’t have much of an opinion on it since I have very little history with 40 North 88 West other than programming the annual New Art Film Festival (NAFF) in conjunction with their Boneyard Arts Festival. Apparently, they like what we’re accomplishing with the NAFF, which presents a day-long program of local-centric independent cinema free of charge to the Champaign-Urbana public every April. Does their Boneyard cross-promotion effectively direct patrons to the Art Theater? Would NAFF attendance sink if it did not take place during Boneyard? I have no answers to these questions at the moment. If nothing else, our working relationship is understated; they provide good word-of-mouth and we expect nothing more. That is that. I have never been compelled to get involved directly with 40 North. I already attempt to do for the film arts what they portend to do with all artistic pursuits in the area. Let’s call a spade a spade, then. 40 North is an ongoing marketing campaign for Champaign County which focuses on the arts as vehicles for inspiration, education, and – yes indeed – commerce. I’d rather see an organization like 40 North in action than not have anything like it at all. Criticisms leveled at 40 North in the BEST Arts piece a few weeks ago are possibly valid but I think there’s little use gnawing on the fence here. 40 North is not our agent, our headhunter, or our pimp. It is not their job to directly connect "We the Artists" with job opportunities, or even hire us in the effort to pump living wages directly into our pockets. Unless I missed it somewhere, nothing on their web site claims as such. So, here’s my advice – work with them, or work alongside them peacefully. Champaign-Urbana is too small a community to weather stupid and needless friction; unfortunately, we’re good at letting it spill over sometimes. I’m just too used to doing things myself to be overly concerned about internal 40 North this or external 40 North that. And I really, really hate whining. SP: What ideas/hopes to you have for the film community? How can it grow? JP: We probably have the strongest nucleus of locally-based, movie related groups that I have seen operating at the same time since I’ve lived here. I’m going to hedge and not prematurely spill ideas shared with me in confidence, but I believe the Champaign-Urbana Film Society (communal film appreciation and filmmaking instruction), Champaign Movie Makers (filmmaker-driven discussion groups, presentations, and exercises), and the Art Theater Co-op (community-owned operating body of the Art) will be giving the C-U plenty of reasons to get excited. I like how their core members have been thinking outside the box but setting realistic expectations for themselves. They’re also very conscious about collaborating with one another as well as groups that have been around for a while – Dark Maze Studios, Dreamscape Cinema, Kill Vampire Lincoln Productions, Roselawn Productions, Shatterglass Studios, Illini Film & Video, et al – for the sake of building strength through teamwork. I believe they need to continue taking baby steps and allow progress to come organically. And finally, I hope all my efforts publishing C-U Confidential and showing “the movies of Champaign, Urbana, and the cities beyond” some love will not be in vain.